At the outset, I want to state that there is no real correlation between spiritualism and magic. However, the so-called pseudo communication with the spirit world did in fact open up a whole new era for magicians. 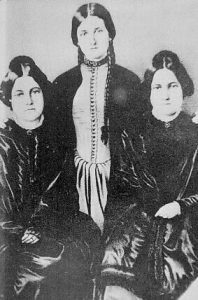 Spiritualism, as well as a new part of the history of magic, began in 1843 when the three Fox sisters, Leah, Margaret and Kate played a practical joke on their rather superstitious mother. They suggested they were in contact with a deceased murdered man who was supposedly buried in the basement of their home. In their tiny cottage situated in Hydesville, New York near Wechester County, the three girls spooked their mother by creating strange rappings or knocks which they claimed was the man’s spirit trying to contact them. Going to bed at night, the girls would tie a string to apples and bump them on the floor which sounded like ghostly footsteps. From these began the growth of an all new religion called Spiritualism that was to influence millions of people in the late 19th century and offer magicians the opportunity to present psychic-type magic tricks and phenomenon into their stage shows. The Fox sisters began to gain notoriety when many people would visit their tiny cottage anxious to hear messages from their departed loved ones. The sisters could create rapping noises by cracking their toe joints or knee and finger joints in answer to questions. One crack meant yes, two cracks meant no, and a person’s age and dates were signalled by the number of raps. 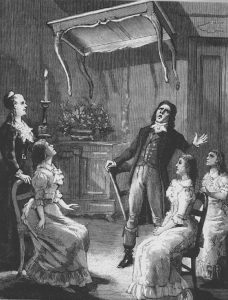 The belief that the departed were communicating through the Fox sisters was eagerly and very quickly accepted. A code for the alphabet was also developed. It was not long before the sisters realised that by giving public demonstrations, financial reward could be theirs. As spiritualism grew quickly, even traditional religions began to embrace this new spiritual movement by adopting it into their doctrine. The girls began to travel throughout America and later Europe. As their fame and fortunes grew, others began to capitalise on doing the same thing through séances. People began to claim that they had psychic gifts of prophesy and mediumship, and the ability to communicate with the spirits of the deceased. It was not long before the intellectuals, academics, and leading professors began to acknowledge this new mysterious phenomenon too that gave it more credence. The author of Sherlock Homes, Sir Arthur Conan Doyle, and other dignitaries, even President Lincoln and Mary Lincoln, became converts to spiritualism, as did Queen Victoria and Prince Albert. Meanwhile people like Douglas D. Home, Florence Cook, and Henry Slade became famous spirit mediums. The Fox sisters were very successful in the beginning. They created the illusion that they could relay messages from deceased persons to their families, and this proved very profitable. It is hard to imagine that by merely cracking their joints and knuckles at the appropriate time, they gave the impression that the deceased were making their presence known by these weird noises. Magicians saw an opening, and very soon, late-night spook and haunting shows sprang up in theatres where ghosts cavorted and eerie table tipping and knocking occurred. Ouija and Planchette boards became fashionable pastimes, and ectoplasm was seen to sometimes emerge from a medium’s mouth, suggesting that this was a spirit making its presence seen and felt. Fake photographs also showed the outlines of ghosts and fairies. With the rising interest in spiritualism and psychic phenomena, a number of pseudo-scientific societies began to emerge like the Society for Psychical Research in both the UK and America. The famous London Magic Circle even set up an Occult Committee, but very few of these organisations exist today simply because there is so little information or data left to examine or research. The Magic Circle Occult Committee closed down years ago, and the Spiritualist Church membership has rapidly declined as people became more aware of the complete lack of credibility of psychic claims like mediumship, clairaudience, fortune telling, clairvoyance, and the like. Despite the so-called 21st century mediums like Peter Hurkos, John Edward, and James Van Prague who have large followings, there is yet no scientific evidence whatsoever to support communication from the grave. Some mediums are really sensitive people who use their skill in suggestion and subterfuge to convince others that their ‘powers’ are real. In my youth, I became a member of the Canterbury Society for Psychical Research in Christchurch, New Zealand, purely to have access to their comprehensive occult library and to attend séances mainly for observation purposes. I thought at the time that it was an extension to my keen interest in magic. My overall impression was people could be gullible and so easily hoodwinked by what appeared to be more parlour-like games and playing with fake spirits. The magic fraternity began to see possible openings to introduce psychic-type magic into their acts. Many used psychic cabinets where supposed ghosts or spirits would make known their (supposed) presence by playing tambourines, voice trumpets, ringing bells, etc. under the guise of psychic happenings. The cabinet and séance acts became very popular, made famous by magicians like the Thorpe Brothers, the Davenports, and Eugene Burger. One of the finest and latest of these performances was by the American couple Glen Falkenstein and his wife Francis Willard who was securely tied to a board by a committee, placed into a trance, and then enclosed inside a curtained cabinet. Immediately all sorts of strange, weird psychic effects would occur with objects being flung from inside onto the stage. Ripping the curtains open, Glen would show Francis still in a trance state and securely bound by the ropes. The art of mentalism also began with people claiming to have psychic powers. 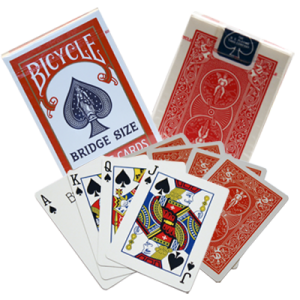 Mentalists demonstrated their abilities though magic that involved thought transference, reading sealed messages, telepathy, ESP, and later psychokinesis, made popular by Israeli magician Uri Geller who so many performers emulated. Spirit slates became popular where spirit messages appeared on blank slates, supposedly written by deceased spirits. This adapted well into a mentalist’s act. In later years, the Fox sisters Kate and Margaret became heavy drinkers and family and money problems developed. Then suddenly on September 24th 1888, Margaret Fox gave a sensational interview to the New York Herald stating that “Spiritualism started from just nothing and I knew then of course that every effect produced by us was absolute fraud”. Later a more comprehensive apology and admission of fraud was released by the Herald, outlining the methods the Fox girls had duped their audiences with. Ill health and declining finances followed, yet many still believed that the sisters did indeed have mediumistic gifts and could communicate with the spirit realm. Sometime later, the sister Kate recanted, claiming that the original confession was false because some spiritualists who were in denial of the original apology had threatened trouble. Magicians like Harry Kellar, Harry Houdini, and Joseph Dunniger spent much of their lives trying to teach the truth about the falseness of psychic claims, carried on today by the likes of James Randi and Derren Brown. The once famous Fox sister Leah died in 1890, while Kate dropped dead in the street on July 2nd 1892, The remaining Fox sister Margaret died on March 8th 1893, all three in near poverty and obscurity. Their spirits of course did not vanish completely as they continue to appear magically at séances, and their names continue to be remembered in the history of magic.